Waterford News and Star — Final chance to enter our Fantasy Golf Challenge…. » Final chance to enter our Fantasy Golf Challenge…. Final chance to enter our Fantasy Golf Challenge…. The good news is that our popular Fantasy Golf Challenge is back once again. The bad news is that if you haven’t already entered then you only have till this Thursday, September 20 at 5pm to do so. We are absolutely delighted to welcome back Faithlegg GC and FBD Hotels as our generous sponsors. Our weekly prize will be sponsored by Faithlegg Golf Club. A green fees voucher to play the excellent Faithlegg GC will be the prize for each weekly winner, but don’t panic if you’re a member of Faithlegg or a non-golfer as you will be catered for too, either in the Pro-Shop or with vouchers for lunch for two. Don’t worry you’ll be in good hands with Karl and all at Faithlegg GC. 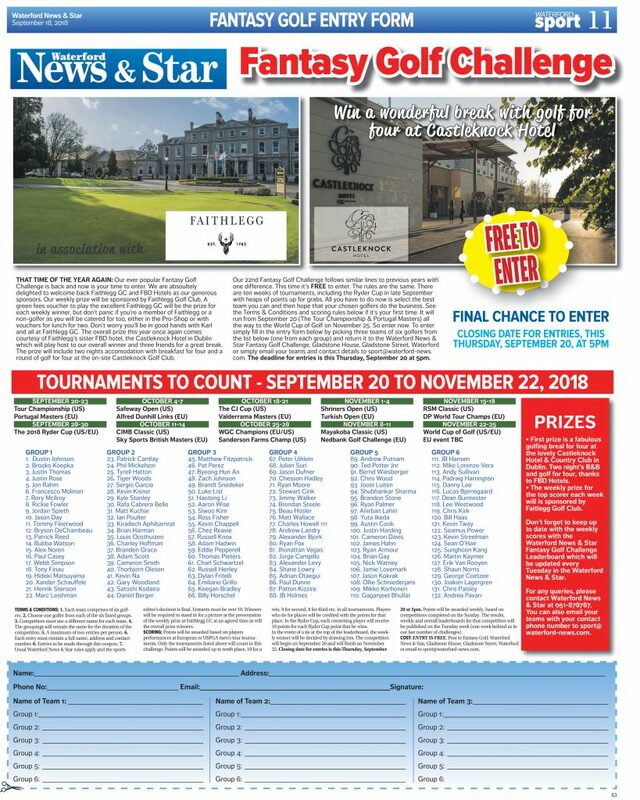 The overall prize this year once again comes courtesy of Faithlegg’s sister FBD hotel, the Castleknock Hotel in Dublin which will play host to our overall winner and three friends for a great golfing break. The prize will include two nights accomodation with breakfast for four and a round of golf for four at the on-site Castleknock Golf Club. Our 22nd Fantasy Golf Challenge follows similar lines to previous years with one difference. This time it’s FREE to enter. The rules are the same. There are ten weeks of tournaments, including the Ryder Cup in late September with heaps of points up for grabs. All you have to do now is select the best team you can and then hope that your chosen golfers do the business. See the Terms & Conditions and scoring rules below if it’s your first time. It will run from September 20 (The Tour Championship & Portugal Masters) all the way to the World Cup of Golf on November Tournaments which finish up on November 20. So enter now. To enter simply fill in the entry form below by picking three teams of six golfers from the list below (one from each group) and return it to the Waterford News & Star Fantasy Golf Challenge, Gladstone House, Gladstone Street, Waterford or by email to [email protected] The deadline for entries is this Thursday, September 20 at 5pm. Good luck.